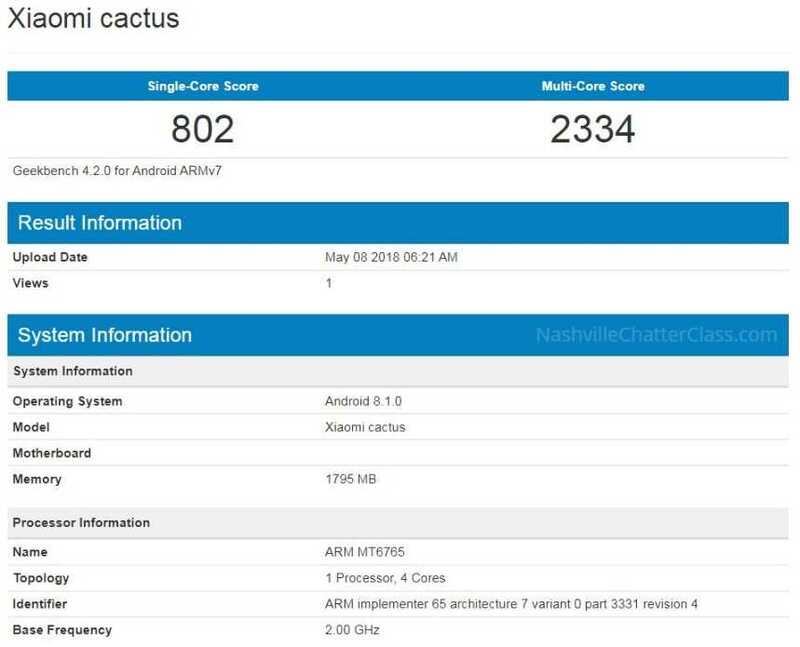 After the recent Geekbench appearances of Xiaomi models codenamed Cereus, Valentino and Dipper, here comes another one named ‘Xiaomi Cactus’, which is a device with average specs. Xiaomi has established itself as a brand that is always associated with affordable yet high-quality devices and has found a name for itself among the masses. The new Xiaomi Cactus seems to be yet another promising entry. We believe this device to be a mid-range model based on the processor information and other hardware specifications found in the entry in Geekbench. According to the GeekBench listing, the phone will be powered by the MediaTek 6765 processor and has a minimal RAM of 2GB. There could also be another variant of this device with better specs but there’s nothing for the time being. The 4-core processor when combined with the limited RAM may not be capable of handling powerful games or multiple apps at once. In the benchmark scores, Xiaomi Cactus has garnered 802 in single-core testing and 2334 in multi-core testing. The single core score is higher than that of Xiaomi Cereus which scored 745, despite the presence of 3GB RAM. The multi core score, however, is higher for Cereus at 3562. The MT6765 chip uses as 12nm processor and clock at a frequency of 2 GHz. Both devices run on the latest Android 8.1 Oreo operating system which should make it popular among those who want their phones to run on the latest OS out of the box and wouldn’t want to wait months for a software update to roll out. Recently, Xiaomi Valentino sporting a Snapdragon 638 processor with 6GB of RAM and running on Android 8.1 was also spotted on GeekBench. The official launch date or other specs of these phones are not known at this point as they are yet to be announced. The Xiaomi Mi 7 is the phone that is confirmed for launch on May 23rd and being the flagship phone from the company, it has sought a lot of attention. The hardware specifications of this model had been confirmed on Geekbench and it runs on the latest Snapdragon 835 processor coupled with 6GB of RAM. Another model codenamed Xiaomi Dipper was also spotted in GeekBench with SDM 845 and other minor differences compared to the Mi 7 hardware specifications. Xiaomi could be planning to have different variants of their flagship model for multiple regions. The leaked rumor also claims that the phone will have an OLED display with an iPhone X inspired top notch and will retain the 3.5 mm audio jack which many other top manufacturers choose to skip in their top-end models. Xiaomi is known for pricing their models right which has attracted more budget-friendly and loyal buyers. On that note, if priced right, the new Xiaomi Cactus model could be a worthy addition to the mid-range segment. The performance of Xiaomi Cactus can be expected to be on par with Xiaomi Cereus. We will know more when the official announcement is made. Title image for representational purposes only.